My favorite type of steak is rib eye steak, so I thought I would create a second post about how to prepare a good rib eye dish. The first and most important requirement in cooking a good rib eye steak is starting with a top quality cut of rib eye. If you want to learn more about how to select a rib eye steak check out my previous post “Select A Rib Eye Steak“. The second factor in cooking a good steak is letting the raw steak rest on a plate on the counter for at least 30 minutes so the steak can get to room temperature before cooking. It is important to do this because if you cook a cold steak the center will take longer to cook so by the time the center is cooked the outside of the steak would be overcooked. 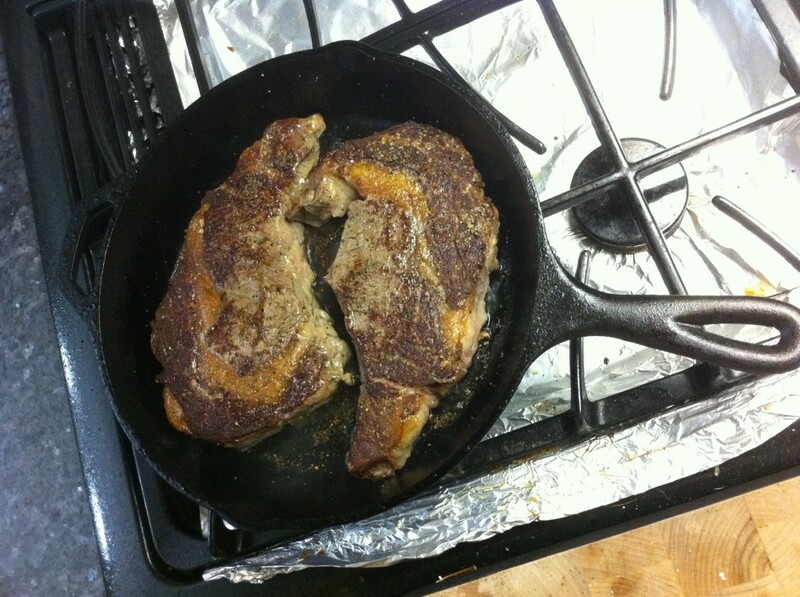 Once you are ready to cook your steak season it well on both sides with kosher salt and fresh cracked pepper. 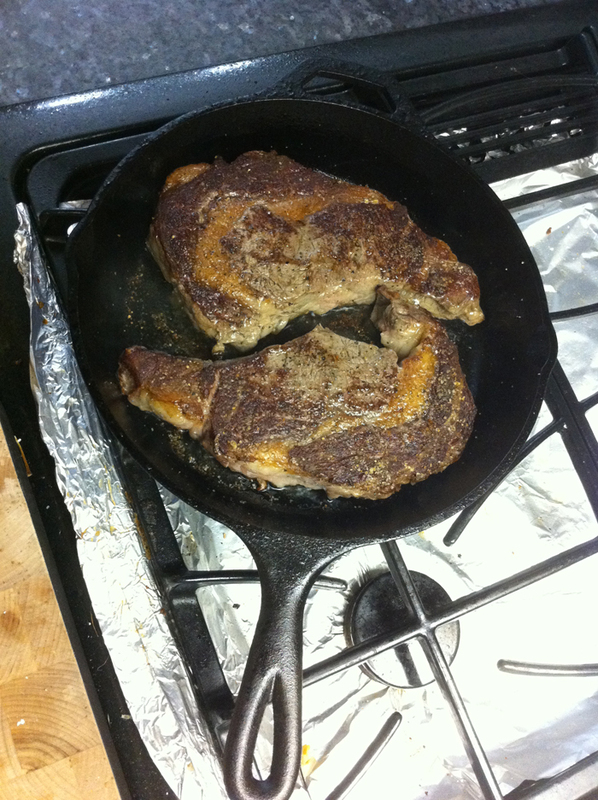 Cook the steak in a heavy pan (cast iron if possible) that has been preheated at the highest temperature possible. Cook your steak on high for 4 minutes on each side on high heat. 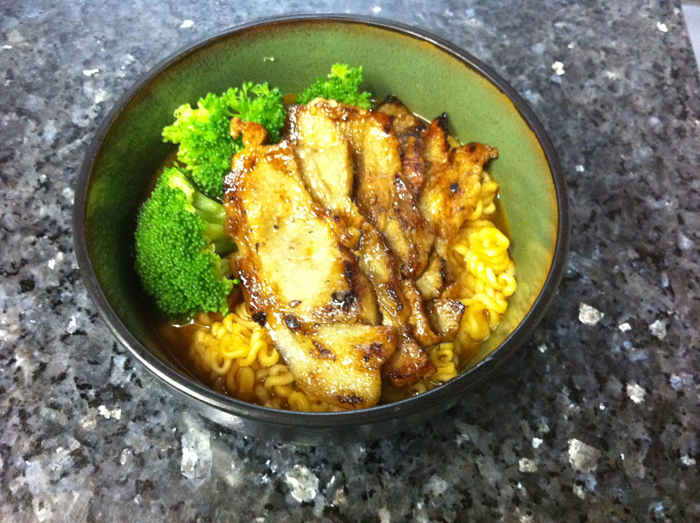 Then reduce the heat down to medium and cook for another 1 – 2 minutes. Your steak should look like this when done. 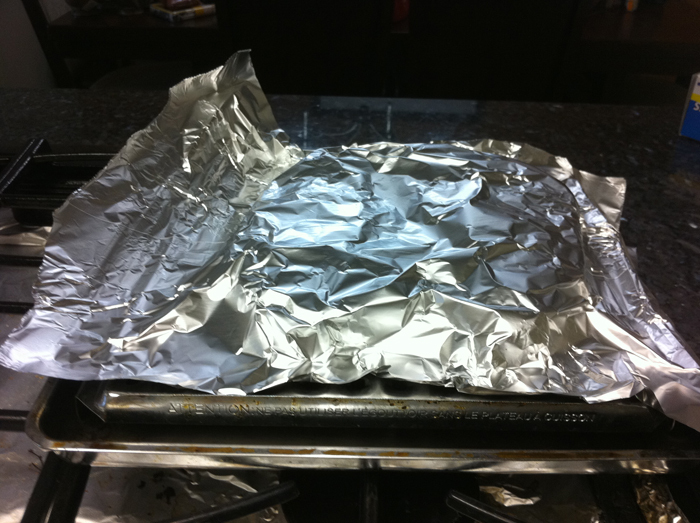 Once finished place your steak on a rack and cover it with foil to let it rest for at least 7 minutes. It needs to be covered so it doesn’t get cold, but you need to let it rest so the juices redistribute throughout your steak. When heated (cooking) the juice in the meat moves around (heat causes motion) almost like the juice is boiling within the steak. If you don’t let it rest and you cut into the steak the juices will rush out onto your plate and leave you with a dry piece of meat. 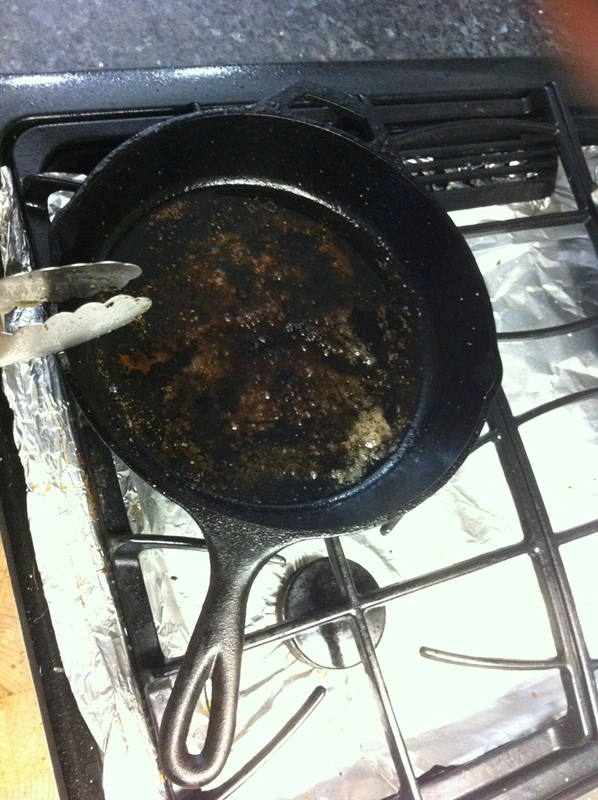 While your steak rests turn your attention back to the pan that you were cooking your steak in. 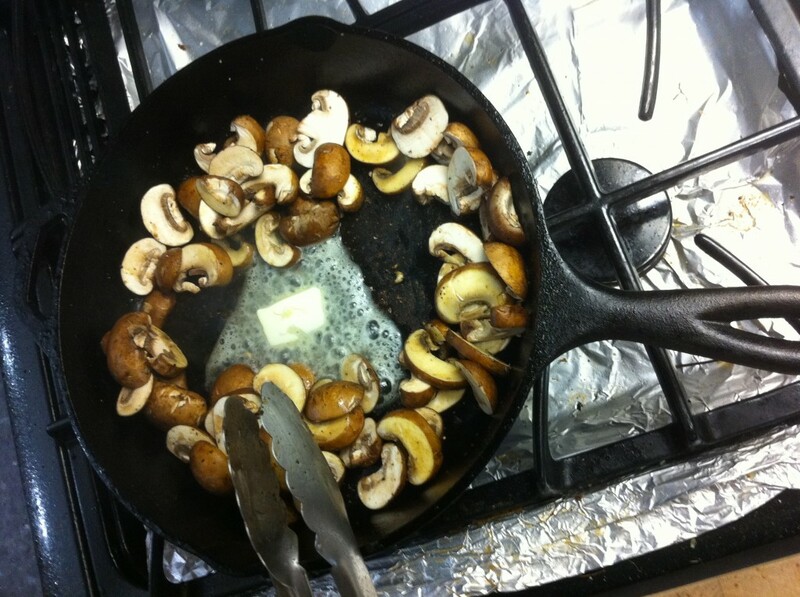 You should notice a good amount of brown bits sticking to the pan with a pool of fat floating on top. 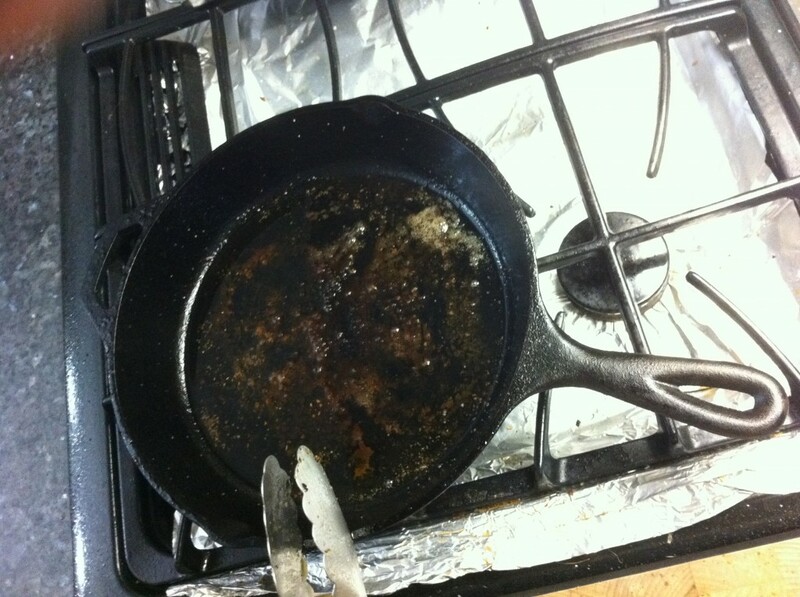 Deglaze the pan with 1/2 a shot of Hennessy. When de-glazing remove the pan from the stove then poor in the 1/2 shot, be careful because it could burst into flames, if it does then just let it burn until the flame goes away. 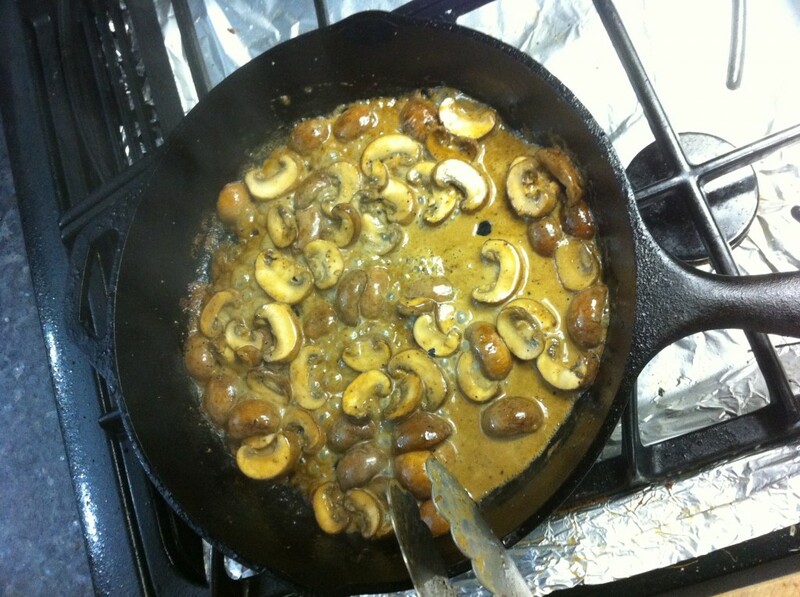 Place the pan back on the stove over high heat and add in one pack of sliced mushrooms and cook until the mushroom is almost cooked (3-4 minutes). 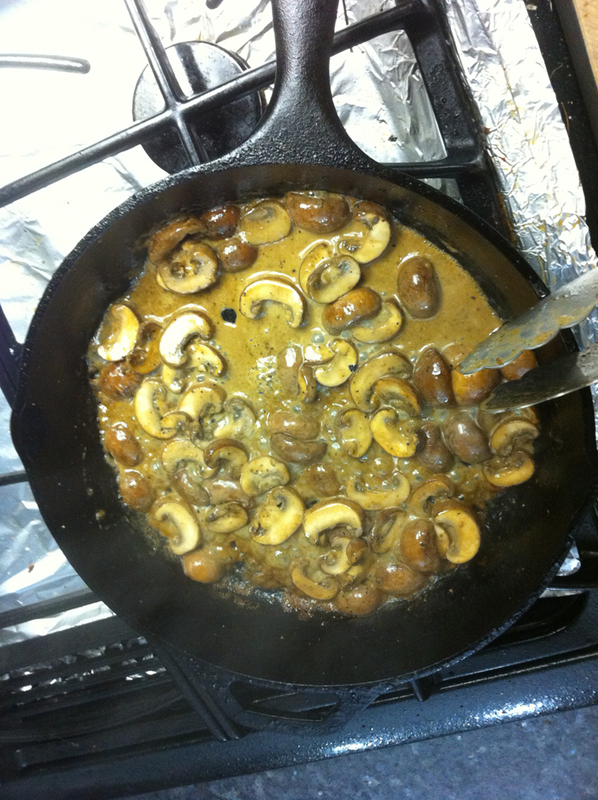 Once the mushroom is almost cooked add in 1 Tbs of butter and 1/2 a cup of heavy cream. 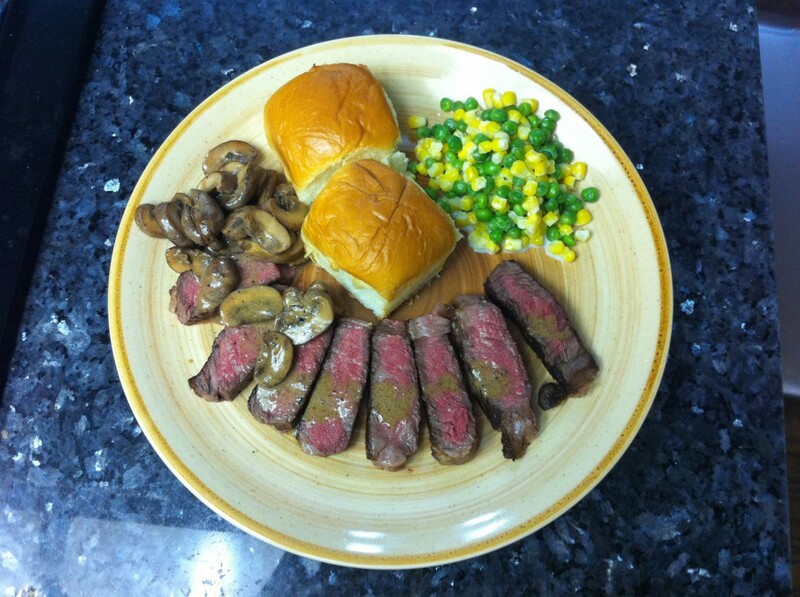 Now just cut your steak into bit size strips (trim off the fat) and enjoy!